Today's Director Essentials entry looks at Ron Howard, who has built a huge career and won Oscars for being professional, commercial and utterly generic. The suggestion comes from Tom K., who wishes Happy Days was still on the air. 1. Night Shift (1982) - Ron Howard's breakthrough as a commercial director turns potentially sleazy material (two guys start running a brothel out of a morgue) into a sitcom. Howard doesn't dull all the edges, though, and allows for a nice leading man turn from his Happy Days co-star Henry Winkler and a dynamic breakthrough performance from a young Michael Keaton. There's an interesting mix of offbeat material and traditional approach that suggested what kind of director Howard was going to be. Incorrectly, mostly. 2. Splash (1984) - If for no other reason than because it made a leading man out of Tom Hanks, we should all love and appreciate Splash. But it's also another early hint of a direction that Ron Howard's career might have taken, in which he makes unconventional stories about unconventional people very palatable and, yes, conventional for wide audiences. He would soon lose the offbeat stuff and just go for the conventional. 3. Parenthood (1989) - This movie marks the next phase of Howard's career, in which he made commercial, large ensemble films centering around a single focus (a newspaper, firefighters, the space program, etc.). The script is from two sitcom writers, and it sometimes shows; mostly, though, Howard pulls off an impressive balancing act between comedy and drama (like Steve Martin's great punchline to his grandmother's climactic roller coaster speech). Plus the cast is really, really good. 4. 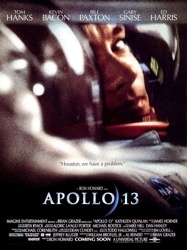 Apollo 13 (1995) - The culmination of Howard's work to this point, and still his best movie. Apollo 13 still feels tense and suspenseful even though we know how it ends. 5. Frost/Nixon (2008) - Howard made his first good movie since Apollo 13 by making his least Ron Howard-ish movie yet. Most of the work was done for him thanks to Peter Morgan's script (based in his play) and two leads that had lived with the roles for years on stage. Howard knows when to stay out of the way and when to infuse what could become a filmed play with some cinematic style. One of his best. It seemed to me that the moral of Parenthood is "Having more kids will fix the problems you have with the kids you already have." I mean, everybody has a baby at the end of the movie and they are all stoked. And half of the characters are in their mid to late forties when they are having these 3rd, 4th, 5th children. I don't understand. That might be a mischaracterization of what the movie is trying to say at the end. I don't think having babies solves anyone's problems. In fact, I think much of the movie suggests it will only cause new problems -- but they're good problems, and ones worth having. I think that's where the movie lands. But that's just me.